Fractionated coconut oil is one of the lightest carrier oils available and is very effective at penetrating the skin. 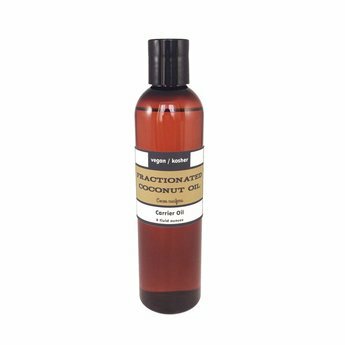 Fractionated coconut oil both seals and moisturizes the skin and is one of the best moisturizing oils available. It is highly stable with a long shelf life and mixes easily with most other natural skin/hair care products. The fractionation process removes all scents from the oil. It makes a great leave-in conditioner. Fractionated coconut oil can clog the pores of some people and should be used sparingly in facial products. Fractionated coconut oil has been separated to leave behind the fatty acids that form solids at room temperature. Therefore, fractionated coconut oil is always liquid at room temperatures. Fractionated Coconut oil is extremely resistant to breaking down and does not go rancid like other carrier oils. The shelf life is indefinite with proper storage conditions (cool, out of direct sunlight). Refrigeration is not needed. Allergic reactions to this oil is a possibility, though less so than regular unfractionated coconut oil.